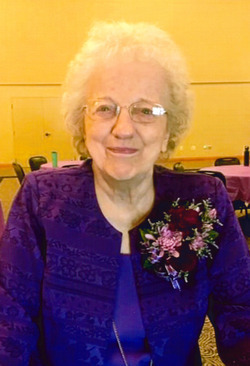 HAWARDEN, IOWA ~ Marilyn (Jensen) Salberg, 90, of Hawarden, died on Saturday, January 5, 2019 at the Hillcrest Health Care Center in Hawarden. Funeral Service will be 10:30 a.m. Wednesday, January 9, 2019 at the Trinity Lutheran Church, LCMS in Hawarden with Rev. Joshua Lowe officiating. Burial will follow in the Grace Hill Cemetery. Visitation with the family will begin at 5:30 p.m. Tuesday, with a Prayer Service at 7:00 p.m. at the Porter Funeral Home in Hawarden. Condolences may be sent to www.porterfuneralhomes.com. The family prefers memorials be directed to the Hawarden Hospital Auxiliary Thrift Store. Marilyn June Salberg was born June 29, 1928 in Sioux Falls, South Dakota, to Henry and Martha (Holtz) Jensen. She attended High School in Inwood, Iowa and later graduated from Omaha Radio and Television Institute with a degree in Airline Communication. Marilyn married J.P. Salberg on October 15, 1949 in Luverne, Minnesota. They later made their home in Hawarden, Iowa, where they owned and operated Jerry’s Jewelry together, until his passing in 1979. Marilyn eventually retired from the store in 1994. Before moving into Oak Hill, Marilyn volunteered many years at the Hawarden Hospital Auxiliary Thrift Store and served as host for many holiday celebrations and special occasions for her family. Marilyn is survived by her loving family, Gary “Cazzie” (Carolyn) Salberg of Hawarden, Ricky (Carol) Salberg of Ireton, Iowa and Tamara (Dave) Ratzsch of Sturgis, South Dakota; 9 grandkids; and 18 great-grandkids. She was preceded in death by her parents; husband; and an infant son, Mark.